Honesty bids me note that our original interest in a portable endoscope was somewhat mercenary. We received a substantial number of requests for assistance with using our Graphic Workshop Professional software to manage images generated by these devices. In order to respond to the first few, we had to Google around for a while to determine what an endoscope actually was. Decidedly a one-trick pony, the one trick in the repertoire of the VistaQuest endoscope – or “borescope,” as these devices are called in some quarters – is decidedly handy. The endoscope consists of a tiny video camera mounted on a flexible probe, along with some bright white LEDs. The other end of the probe is connected to a hand-held video monitor slightly larger than a GPS receiver. The probe can be slid into places that would otherwise be inaccessible, to see what lurks behind walls, down pipes, under furniture and at the back of your refrigerator, if you haven’t dared clean it out in a few months and are inordinately fond of cheese. 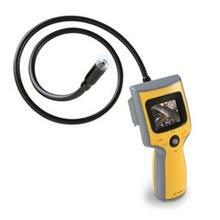 The VistaQuest DVR2 ups the game of a base-model borescope by adding imaging to its display monitor. It will save its peregrinations through the labywrinth of your walls and plumbing either to still JPEG images or to AVI movies. It has 32 megabytes of internal memory for images, and an SD card slot to allow for effectively unlimited storage, at least ‘til you run out of cards. The DVR2 includes another enhanced facility – it ships with a hook and a magnet that can be affixed to its probe, allowing those of us with poor eye-hand coordination to retrieve small objects dropped into otherwise inaccessible locals. This is to say, you can use it to fish your car keys out of drains and air vents. In use, the DVR2 is dead easy to work with, but it does require a bit of practice to master. As might be expected, it will be up and running as soon as you turn it on and slide its probe into somewhere dark and treacherous. Its video, while remarkably detailed and of more than adequate quality for sneaking around pipes, does have a finite degree of contrast resolution. Keeping in mind that the camera and its source of illumination are at pretty much the same location, it’s relatively easy to wash out whatever the probe is looking at, rendering it solid white. With five or ten minutes to familiarize yourself with the device, you’ll be able to manipulate the probe to provide a workable view of whatever it’s asked to view. Most of the technique involved in successfully opperating the DVR2 involves not trying to get too close to whatever you’re interested in. Our DVR2 was purchased from Hammacher Schlemmer, which seemed to be the only retailer who actually had a borescope in stock at the time we went shopping. While easily up to Hammacher’s usual level of quality and slightly elevated prices, ours did embody a few setup issues. The most notable of these was that its menus only knew how to communicate in a single language, the language in question being French. VistaQuest appears to have its head office in France. Despite our being in Canada, not everyone here knows how to speak French… some days it shocks us too. We contacted VistaQuest, which promptly e-mailed us new firmware for the DVR2. Our DVR2 will now display its menus in our choice of English, French, Italian and Spanish. It wasn’t much of a deal breaker, although it seems an odd thing for Hammacher to have overlooked. The VistaQuest DVR2 is well made. While manufactured in China, with a few rough edges, it’s solidly built and intuitive. Its battery compartment closes with a Phillips screw, which is mildly inconvenient. Its case is resilient enough to survive the sort of abuse that working tools can be expected to sustain. In use, the DVR2 will almost certainly frighten you with the state of your air ducts. It may very well prevent you from driving nails through the wiring or pipes hidden in your walls – in which eventuality you’ll no doubt regard it as being worth twice whatever it cost. It’s proficient at finding leaks – or happily, the lack of same – in the engine compartments of contemporary sports cars, which have about as much working room as a Tokyo subway car during rush hour. It can peek behind drywall for evidence of foundation cracks – we didn’t find any of those, either. Its applications will be limited only by your imagination and the general level of inconvenience of the building in which you find yourself. The singular ability of the DVR2 to document what it sees can be of enormous use for things like warranty issues, insurance claims and requests for quotes. Alternately, you can creep your friends out with videos of the state of your walls.